Sandy Hunter kissed her husband goodbye one normal morning on her way to work. She never made it. Last seen walking alone into a Las Vegas hotel room, she never came out and no sign of her remained in that room. Her missing person’s case went cold for fourteen years until retired Las Vegas detectives Debra Pickett and Sarge Carson, members of the Cold Poker Gang, decided to investigate how a woman could vanish from a locked hotel room without a trace. 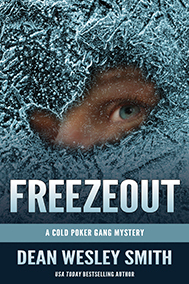 Another twisted Cold Poker Gang mystery from the prolific mind of USA Today bestselling writer Dean Wesley Smith. If you love puzzle mystery novels, grab a Cold Poker Gang mystery novel.